Compassionate care coupled with advanced, on-site diagnostics and treatment. Emergency care can be costly. Reduce hazards and save money. Sometimes it is a simple as reducing or eliminating hazards first, like child proofing a house. Making an effort to keep your pets out of harms way can save thousands in veterinary expense. 1-888-426-4435 (1-888-4-ANI-HELP) available 24 hours a day, 365 days a year. There is a $65 consultation fee at the time of this posting - February 2017. If you suspect your pet got into poison, take the Better Safe than Sorry approach. Bring your pet in for an exam. Sooner is better, and it can be less expensive than waiting. There are different active ingredients in various mouse/rat poisons. Each requires a different treatment. It is VERY important to bring in any packaging of the poison that your pet may have ingested. The ingredients are designed to attract rodents, unfortunately, they also attract pets. It is extremely important to bring your pet in as soon as possible after ingestion of a rodenticide. Your pet may not start showing symptoms for days, but waiting to treat until symptoms are apparent may mean that treatment may not be successful. Seeing something drop on the floor is often a trigger for a pet to dive for it. Vials can also be snatched off counters, out of purses or off tables. Keep any medications (whether your own or your pet's) in a pet safe location. Different medications can pose different problems and can vary depending on the size of the pet and the quantity ingested. Keep in mind that ANY human anti-inflammatory (ex. Tylenol, Advil, Ibuprophen, Aspirin, etc.) is BAD for your pet. PERIOD. Resist the urge to go to the human medicine cabinet for your pet unless you consult your Vet. Flea and tick products are an important asset for our pets, but misuse can result in toxicities. It is safest to only use medications prescribed and recommended by your veterinarian. Your pet should have an examination before starting any flea/tick control programs. Take precautions to prevent your pet's exposure to: antifreeze (ethylene glycol), paint thinners, drain cleaners, bleaches, detergents or aerosolized products. Once exposed, seek treatment for your pet. 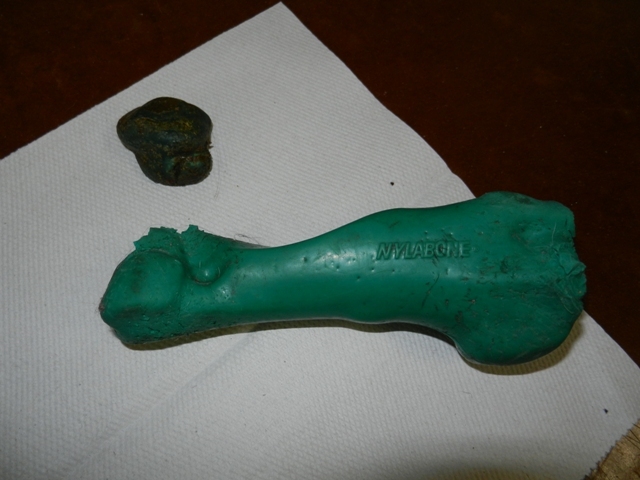 Objects your pet may chew on could contain potential hazards, such as lead paint. Let your vet know what your pet may have eaten. Fertilizers and other lawn treatments can end up on your pet's paws and then ingested when they lick their paws. Pets can also chew or eat treated plant material. Long strong fibers such as string, floss and carpet strands are a major concern. Often one end moves through the digestive tract, while the other end gets stuck. When the first end continues travelling through the intestines, the digestive tract gets bound up along the way. When pulled taught, these little fibers can act like a knife, cutting into intestinal walls. These pose a hazard for electric shock and your pet's interest in cords must be carefully discouraged and monitored. Sprays that taste bad to your pet can be useful to help them from picking up or chewing on objects that we don't want them to. Rabbits seem to have a particular fondness for chewing on cords. 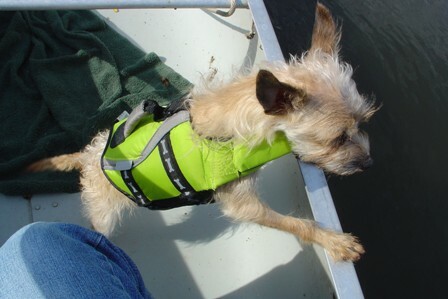 Life vests are available for pets and not only are great for safety, but also help keep your pet warm. Watch thin ice areas, pets can fall through too. Pets, like people are warm blooded and can also suffer from theeffects of hypothermia. It is hard to always stay one step ahead of our inquisitive little friends. It is not always easy to anticipate the hazard before it occurs. Other common outdoor hazards include fish hooks, falls from high places, cuts from barbed wire fences, and corneal injuries from dog's hanging their heads out car windows (flying debris). a duck caught in a plastic snow fence (came in with fence portion attached). Speaking of pet birds, NEVER allow your bird to be flying indoors when a ceiling fan is turned on, or the windows open.